I worked for Willie Smits at his Wanariset Orangutan Center in East Kalimantan in 1996. I was only seventeen years old, and it allowed me to have an unforgettable experience with orangutans. I worked with a group of juvenile orangutans that were getting ready to be released from the rehabilitation center where they were being caged in small groups. I joined the release team in the Sungai Wain forest and stayed there for another five months afterwards to observe the orangutans adapting back to life in the wild. Once you get to know orangutans, there is no way you'll ever forget them. They stay in your heart and mind forever. After this experience I was determined to return to Indonesia to be able to do more for the orangutans. So a few years later when Willie asked me to come back and work at one of his new rescue stations for confiscated wildlife, I gladly accepted his offer. Willie had been given an endowment by Mrs. Puck Schmutzer and he was building a network of wildlife rescue centers in Indonesia. I had met her when I was in Jakarta in 1996 and again in the Netherlands in 1998 when she was very ill and she asked me to visit her in the hospital. She was an incredible woman who made a lasting impression on me. Her dedication to helping animals was endless and her biggest wish was to help the animals of Indonesia. I was happy and excited to be involved with these new projects. Willie and the Gibbon Foundation built rescue centers in more than a dozen different locations in Indonesia. It was a great plan on paper but unfortunately the implementation was not good. Many things went wrong at the centers, and in 2006, two years before the original end date of the MOU (collaboration agreement) between the forestry department and the Gibbon Foundation, Willie and the Gibbon Foundation suddenly ran out of money. This came as a complete surprise as all centers thought we were safe on funding for at least another two years. The centers felt the effects immediately. Thousands of animals had been taken in at the centers and all of a sudden there was not enough funding to care for them. This was the main reason why we would found JAAN. We needed to continue to help Indonesian wildlife-- and especially those animals already under our care couldn't just be abandoned. The last center built by the Gibbon Foundation was in Sintang, in the beginning of 2006, on the property of the Pastor Jacques Maessen, who I had put in contact with Willie years earlier, in 2002 when I had received an email from a Dutch friend who told me that in the remote West Kalimantan town of Sintang there was a Dutch Pastor who was illegally keeping a baby orangutan. Willie contacted him and they soon became friends. In Sintang, some of the animals died while others were relocated to unknown destinations. Our friends at the Centre for Orangutan Protection (COP) had gone there to investigate the situation and discovered two orangutans being kept in filthy surroundings in the yard of the Pastor's assistant, a woman named Dwi Astuti. The orangutans did not even have clean water to drink. One of the orangutans died. The other was sent to be cared for at a small transit center in the city of Ketapang, which had also been started with money from the Gibbon Foundation only to be abandoned. It would soon be taken over by the organization International Animal Rescue. In 2008 I founded the Jakarta Animal Aid Network (JAAN) with several friends and colleagues who I had worked with in several of the centers built by the Gibbon Foundation. The initial reason for founding JAAN was to find support for the rehabilitation centers that had been left without funding when abandoned by the Gibbon Foundation. It had not been easy and many animals suffered. No one even knows how many animals died. JAAN works to protect and rescue all animals, both domestic and wild. We have not had many opportunities to deal with orangutans, except for a few special cases involving confiscations of illegal pets in Jakarta. I was far from the orangutans in their forest home, but I always did what I could from where I was by rescuing them from illegal captivity and helping to try to relocate them to the appropriate rehabilitation centers in Kalimantan and Sumatra. All this changed in May 2010, when I was asked to join the O-Team and help out on an orangutan rescue mission in West Kalimantan. Several of my friends and colleagues from COP and Orangutan Outreach were on the mission, which was led by Willie Smits. There are many orangutans being kept in captivity in this remote Indonesian province and they are in desperate need of rescue. International Animal Rescue had begun rescuing orangutans and bringing them to safety at the temporary transit center it had taken over in Ketapang, but there were many more orangutans that needed help. Ironically, it was Willie Smits himself who had set up Ketapang, but it too had been abandoned when the Gibbon Foundation ran out of money. Willie now wanted to set up a new rescue center in Sintang with his old friend Pastor Maessen. I accepted the offer with some trepidation—knowing full well the tragic history of the Pastor with orangutans. But the orangutans needed help so I couldn’t say no. We were soon on a plane heading from Jakarta to Pontianak, the capital of West Kalimantan and then on the Missionary Cessna to Sintang. We spent three days rescuing orangutans from horrific conditions in Sintang. I have to say I was shocked to see that there were still so many orangutans being treated so badly. It woke me up from a misconception that I had had for some years-- that with so many active orangutan conservation organizations on the ground that the problems were being resolved and the orangutans were not in such dire straits. It really hit me hard to see the innocent orangutans caged, chained and being treated so badly. The orangutans we rescued were brought to the new Sintang Orangutan Center (SOC)-- which we named together. Our plan was to apply for a legal status for the center as soon as possible and in the meantime strive to find proper release and rehabilitation sites for the orangutans. We all agreed that the cages and facilities at SOC were completely inadequate for long-term care-- especially considering the past experiences with Pastor Maessen and his assistant Dwi. The truth is none of us were comfortable leaving the orangutans with these people given their history, so we agreed to have trained staff members from JAAN and COP stay behind and take care of them while we arranged for professional vets to come over to help. Orangutan Outreach helped with the costs. A few months later, Rosalie Dench, our first volunteer vet arrived from the UK. Things were not easy for her or any of our colleagues. The truth is that the local management there was in fact a group of people that had a religious organization and worked to safeguard the culture of the Dayak people. This is a beautiful mission-- but they had absolutely no understanding of orangutan care and wildlife management. This is precisely why we all knew that we had to keep our staff there. Nobody was pretending otherwise. From the very beginning we offered to assist the SOC with obtaining a legal status as an orangutan rescue center. We also provided an orangutan husbandry protocol that is used by many other centers. Volunteer veterinarians even worked hard to make a veterinary protocol. But if the management did not want to listen, what were we supposed to do? The situation was out of our hands-- and it was the orangutans who were suffering the consequences. We all knew that changes needed to be made, but the management just would not listen! The volunteers and professional staff were treated very unkindly from the very beginning. Food for volunteers was hardly provided. The living conditions were totally unacceptable. These were volunteers with years of primate experience who came to share their knowledge with the locals, but they were simply pushed out by that woman Dwi. I felt ashamed for these volunteers who I had personally asked to come and help. I had asked them in the beginning because I saw that we needed good, professional people. But when they arrived, Dwi actually made them pay money to stay and treated them so badly! One volunteer, Josha Rijlaarsdam, caught malaria and was ignored by the management when she needed to be hospitalized. She could have died! I had to help her get to Jakarta. The way she was treated by the management at the SOC was totally unacceptable. Another volunteer, Kim ten Damme, a Dutch veterinarian with many years of experience with great apes, caught malaria, yet she was not assisted with any medical help by the Pastor and Dwi. They just left her there alone. Fortunately Kim is a strong person that managed by herself to gain her strength back and stayed there for the sake of the orangutans until she couldn’t take the situation anymore too and left in March 2011. It's only because of their dedication to help orangutans that these volunteers managed to stay for a few short months at the SOC despite the horrible mistreatment and abuse suffered at the hands of Dwi. They had planned to stay for much longer but just couldn't cope with the conditions. They had even arranged for free medical supplies and equipment to be brought in from Europe, worth thousands of euros. And this was the thanks they got from the Sintang management? By the end of 2010, JAAN made it clear that we weren't going to accept this any longer. COP also had the same feeling. The management just didn’t seem to care about orangutans. Orangutan Outreach was outraged, and we all knew that if things continued there would be a tragic ending to the center. But no matter how much we complained Willie Smits refused to act. He kept telling us everything was under control, but it wasn't. It was totally out of control and Dwi was the reason. He also kept insisting it was legal, but it wasn't. And everybody knew it. We only wanted to do what was best for the orangutans and we all knew that what was happening at Sintang was terrible by any measure. By spring 2011, nearly a full year after forming the center, and despite what Willie insisted, the status was still not legal. All orangutans in the center were kept under what is called "surat titipan sementara" (temporary holding permit; which is to say no formal rescue / rehabilitation status). It was then that tragedy struck. In April we got a shocking message from Orangutan Outreach Director Richard Zimmerman. Willie had just told him that Luna, one of the baby orangutans at Sintang, had gotten 'lost' in the forest next to Kobus and had 'disappeared'. When we heard about this, we decided to send people there with our colleagues at COP to look for Luna and assess the situation. Orangutan Outreach, the main fundraiser for the SOC, supported us in this decision. We all knew that something was not right. But nobody was saying anything. When they arrived our team wasn't welcomed in the SOC center. The local staff was actually instructed by Dwi not to talk to us or tell us anything. Our teams were there for one reason only-- to help find missing baby Luna. And to be treated like this was not right. We had set this center up and we had every right to come and look for Luna. We were assisted on the ground by local scouts to help search the forests, even using hunting dogs, putting up posters, visiting houses, etc. Months later, no one knows what happened to Luna. And the worst thing of all is that no one ever questioned Dwi. It was then that we at JAAN, COP and Orangutan Outreach all said "Enough is enough!" and we requested that the Ministry of Forestry please step in and relocate the remaining orangutans to another rescue center for their own safety. Fortunately International Animal Rescue (IAR) was able to receive them in their center in Ketapang-- even though they already had their hands full with several dozen displaced and orphaned orangutans in need. The center in Ketapang is the exact opposite of the Sintang center. First of all it is legal. Second, there is a professional team of orangutan veterinarians there. Sintang did not even have a professional orangutan vet for months! And third, Ketapang has a good relationship with the Ministry of Forestry. Now that the orangutans have been safely relocated to the IAR rehabilitation center we finally have some peaceful nights of sleep, but we still are confused about the mentality of the management at SOC along with that of Willie Smits, who continue to make up stories about what a great place it was, because it wasn't. I am very happy that I was able to help rescue Pingky from the chain growing in her neck and Pungky from the tiny cage but I am sad and disappointed how things have developed. Luna is in my mind all the time. 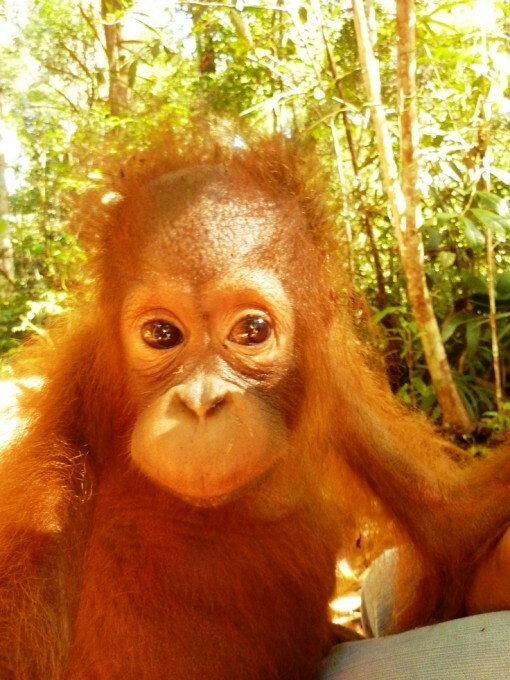 It is simply not believable that a baby orangutan can just 'disappear' like that. If there had been a proper, professional management in place, and if the people there would have been open for suggestions and input from others, this would never have happened. Luna would be safe with her friends. She was supposed to be safe at the Sintang Rescue Center, but she was not. I feel extremely bad for the handful of professional people in Sintang who were serious about rescuing and helping orangutans-- many of whom traveled to Indonesia at their own expense. They suffered so badly under the terrible management at the Sintang Orangutan Center, and then had to return back home earlier than they had been planning... full of questions and doubts about this sad, horrible situation, traumatized from everything that had happened. I hope there will be a change soon for the sake of the orangutans. I am extremely upset to learn that now the organizations involved with the rescue of the orangutans are being accused of doing this for fundraising reasons. Nothing could be further from the truth. All organizations involved-- JAAN, COP, Orangutan Outreach-- had been requesting for changes and discussions about the management in the center from very early on, but Willie just ignored all our requests. Willie still claims the center was legal, but if the status was legal, then the forestry department would never have undertaken the action of moving the orangutans to Ketapang. If anyone questions this, they can simply go and ask the forestry department (KKH). There were many good people who wanted to make the Sintang center a professional place to bring orangutans in need! The accusations by Pastor Maessen, Dwi and Willie Smits that these people were 'arrogant foreigners' is just not right. It is completely untrue. All people working there collaborated well with the animal caretakers-- all local people-- sharing knowledge and spending so much time together and still remain friends. It was the management at Sintang that was the problem. They never cared about the orangutans, and this showed in their actions. And this attitude and behavior ultimately resulted in the loss of Luna. What I will never accept is how Willie told me that I shouldn't look at the few individual orangutans, but instead at the bigger picture. That's not true. I couldn't disagree more. Every orangutan that we rescue is a BIG responsibility and we need to fulfill everything needed to make sure that individual is allowed to live a life free of pain and fear and in good health. There are no exceptions. Again, I have to say that I am confused and saddened to learn about the actions and accusations against us coming from Sintang. It is really not helping the orangutans at all.